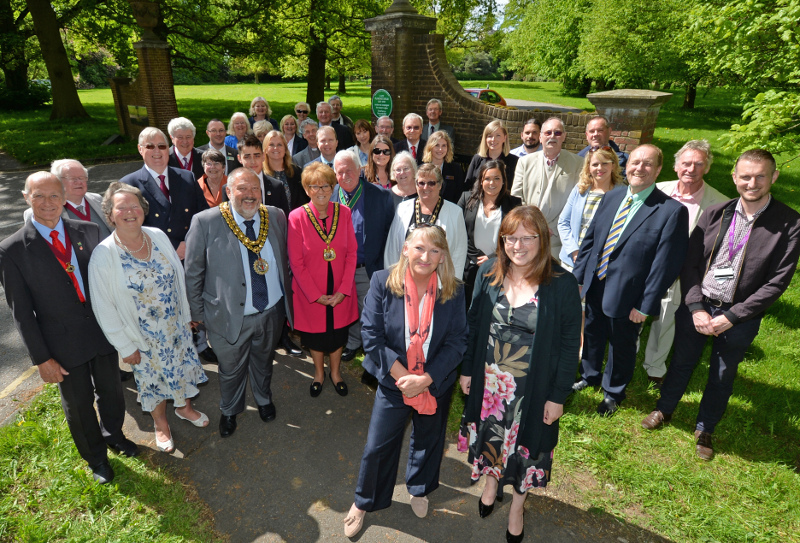 The Leicestershire County Council Green Plaque Awards are awarded to people and places around the county, nominated and voted for by you. Having obtained a scholarship to study medicine, John Barrett was commissioned into the Leicestershire Regiment in January 1916. Based at Glen Parva Barracks, in July 1916, he joined the Regiment's 1/5th Battalion in France. Three weeks before the end of WWI, in a night attack on enemy positions, a number of men lost direction owing to the darkness and smoke. Without hesitation, John Barrett collected all available men and charged the nearest group of machine guns. In spite of being wounded, he pressed on, gaining the trench and attacking the garrison. He was again severely wounded, but refused help and continued fighting. His gallantry was rewarded with the Victoria Cross. Born in Hugglescote in 1893, Arthur showed a talent for poetry from an early age. Lured by the forces, he joined the Leicestershire Regiment in 1915, where he displayed considerable bravery in leading his men into prominent battles. Despite his leadership responsibilities, he wrote poetry in the trenches of France and Flanders and his first book, 'Crimson Stains' was published in 1917 revealing the horrors he witnessed. Despite his literary success, he continued to live the remainder of his days in the village he loved and never really left. Nominated by Michael Kendrick of Old Woodhouse and Llynda Baugh of Thringstone. Thomas Cook is the world's best-known name in travel, thanks to the inspiration and dedication of a single man. Thomas Cook began his international travel company on the 5 July 1841, with a successful one-day rail excursion at a shilling a head from Leicester to Loughborough. From these humble beginnings Thomas Cook launched a whole new kind of company – devoted to helping Britons see the world. Nominated by Stanley Cramer and Carol Kirk, both of Loughborough. Nominated by the Loughborough Labour History Group. Heavyweight boxing champion of Great Britain. Born in Market Harborough in 1926, Jack began his boxing career whilst serving as a Grenadier Guard in the British Army. He won the Amateur Boxing Association Heavyweight title in 1948, representing Great Britain in the Olympic Games the same year. Gardner began his career as a professional boxer on 12 December 1948 in a novice tournament, winning all of his fights by knockout in the first round. In November 1950 he became Heavyweight Champion of Great Britain. He retired at the age of 29 with a record 28 wins, 23 by knockout. Nominated by the Market Harborough Civic Society. Born in 1876 and orphaned just before his ninth birthday, Robert Gee was sent to the workhouse and later the Countesthorpe Cottage Homes for orphaned children. He enlisted in the Royal Fusillers in 1893, serving in Gallipoli in 1915 and the Battle of the Somme in 1916, where he was seriously wounded and for which he was awarded the Military Cross. On 30 November 1917 in France, Captain Gee single-handedly attacked a German machine gun post, killing eight of the crew. He was wounded in the engagement, which was later described as a 'magnificent exploit' and for which he was awarded the Victoria Cross. Nominated by Derek Seaton of Leicester. We will start work organising the installation of the successful six plaques. You voted for your favourite Leicestershire people and places to be honoured with a Green Plaque and here are the final six from the previous round of the scheme. In 1942, the HMS Petard was engaged in the hunt for a German submarine. When the submarine surfaced alongside HMS Petard after being ‘holed’, it was imperative that the Royal Navy locate the Enigma machine and code book that contained information vital to code-breakers at Bletchley Park. Sixteen-year-old Tommy Brown from Earl Shilton helped rescue the documents, swimming back and forth between the sinking submarine and HMS Petard. The bravery of Tommy Brown and fellow seamen, Anthony Fasson and Collin Grazier, helped Britain survive the war, the details of which only came to light 55 years later when they were released from the Official Secrets Act. Built in 1914, the Drill Hall was the headquarters of both the ‘A’ Squadron Leicestershire Yeomanry and the ‘C’ Company 1/5th Leicestershire Territorials, both of which suffered heavy casualties in France during WWI. The Luddites were a group of workers who destroyed machinery that they felt was threatening their jobs. At midnight in 1816, a group of Luddites attacked the hugely successful Heathcoat and Boden’s lace factory in Loughborough. The factory operated 55 machines which were destroyed in the attack. Rumour had it that rival Nottingham lace manufacturers may have financed the raid. With the machines destroyed, production was transferred to Tiverton in Devon. After becoming a widow, Ann Hely answered the call for nurses to work in the East, nursing the sick and wounded soldiers of the Crimean War. Anne, who was from Ravenstone, travelled first to the Smyrna hospital and then transferred to the purpose-built Renkioi Hospital designed by the celebrated Isambard Kingdom Brunel. In December 1897, Ann was awarded the coveted order of the Royal Red Cross. A hand-written letter from Florence Nightingale to Ann Hely confirms that Nightingale knew of Hely and her excellent reputation as a nurse. Born in 1911, Kenney was the artist who created the image and personality of Thomas the Tank Engine and the other engines in Reverend W. Awdry’s famous series. From Kibworth, Kenney was also a fine artist, painting rural and country scenes using the local hunts as his subjects. Born in 1767, Pearson became Rector of South Kilworth in 1817, where he carried out decades of observations, especially measuring the times and altitudes that the Sun, stars, planets and the Moon crossed the southern meridian. His major work ‘An Introduction to Practical Astronomy’ won him the Royal Astronomical Society’s gold medal. He built an observatory on the south side of South Kilworth which is still standing today.